How to create a new VSA user account within an existing vendor record. Select New Vendor Registration even though the vendor is already registered. This gray/blue box will appear below and you need to enter the FTIN number (Federal Tax Identification Number) and select Search. When the Vendor Profile appears, scroll down to the bottom to the User Profile section. Fill that section out and then check the box under Registration Verification. User ID can be first name with last name and no spaces or first initial and last name. The User ID must be 9 or more characters in length. The acceptable characters are letters, number and the following special characters: _ . - and @. Select Submit, then select the Vendor Services Application Login link. You will be asked to set up 3 security question. This will allow you to recover your password if forgotten. Select Submit. 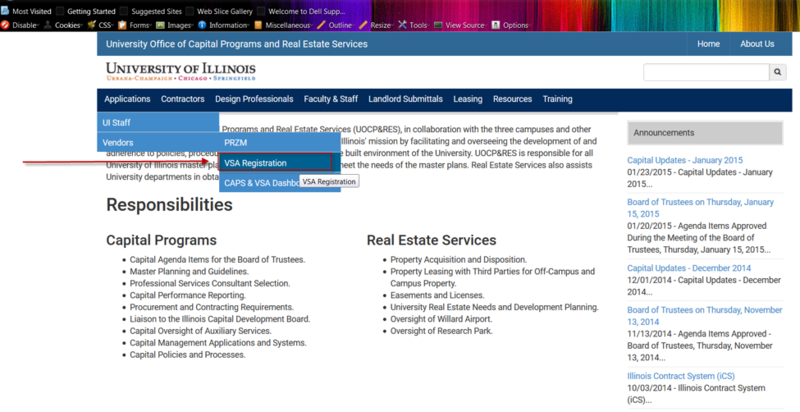 Now you are ready to log into Capital Program Applications.